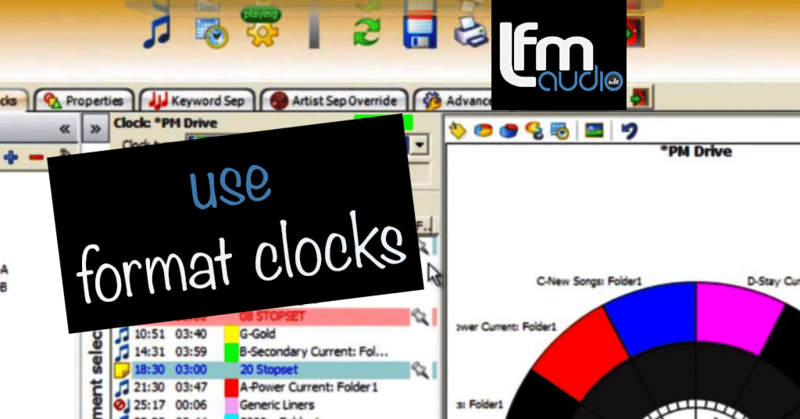 Use format clocks to create consistent balanced radio and boost ratings. When it comes to creating professional radio that listeners respond to, it’s important to deliver a consistent balanced format to give your listener a sense of order & reliability. By using format clocks to plan your programming hour you can easily craft a bang on lineup every hour day after day, that your listeners will recognize and respond to. Here’s a few tips on how to use your format clock effectively. The biggest key to using format clocks is to adjust them slightly to avoid repetition, listeners love familiarity but are repelled by repetition. So have a few subtly modified versions to rotate throughout the day to shake it up enough. Just be sure to maintain a good balance between your imaging, spots, talk and music, while adjusting the order in which they are scheduled. Your format clocks should be a direct reflection of your programming strategy. If you have previously decided your station should play 70% classic hits and 30% newer music then plug those proportions right into the program, this will enable you to create a solidified image that is consistent across the day. Give listeners the sense of variety by alternating the length and style of imaging, for example leading into a TOH with sung jingle, then with a sweeper the next hour. This lets the listener know a content change is coming as expected, but without repetition. Use a format clock to minimize interruptions. Any time a listener perceives an ‘interruption’ then it is a place they could potentially switch off. Some obvious places this can happen is when the station goes to commercial or the segment changes without any lead up or promo. By using you format clock to forcibly insert the appropriate trails and promos you can avoid the loss of listeners. These are just some of the ways a format clock program can contribute to a slick, professional sounding broadcast that you listeners will respond to. By pre-loading set clocks with all the content it’s easy to relax and knowing your scheduling is on point and ready to roll.